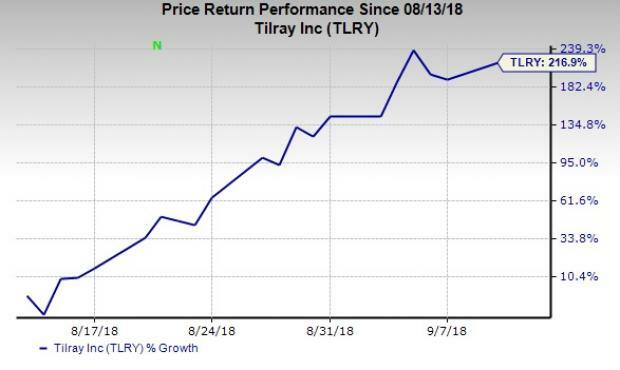 Tilray, Inc. TLRY was a big mover last session, as the company saw its shares rise more than 8% on the day. The move came on solid volume too with far more shares changing hands than in a normal session. This stock, trading within a volatile range of $24.25–$89.86 in the past one-month time frame, showed a sharp increase yesterday. The company has not seen any estimate revisions in the past month, while the Zacks Consensus Estimate for the current quarter hasn’t been in a trend either. The recent price action is encouraging though, so make sure to keep a close watch on this firm in the near future. Tilray currently has a Zacks Rank #3 (Hold), while its Earnings ESP is 0.00%. A better-ranked stock in the Medical – Drugs industry is BioSpecifics Technologies Corp BSTC, which currently sports a Zacks Rank #1 (Strong Buy). You can see the complete list of today’s Zacks #1 Rank stocks here.